Biological treatment that takes place in a continually operated slow sand filter is well documented. By comparison, intermittent sand filtration is less well documented, mainly because until the early 1990’s, it was not really practised at all. In fact, there was a general consensus that intermittent filtration should be avoided. One of the reasons for this had been observed declines in bacteriological quality alongside declining oxygen levels (Paramasivam et al, 1980 [ref.02]Ref.02: Paramasivam, R.; Joshi, N.S. ; Dhage, S.S. and Tajne, D.S. (1980). Effect of Intermittent Operation of Slow Sand Filters on Filtered Water Quality. Indian Journal of Environmental Health, Vol.22, No.2, pp.136-150.). The processes involved in continually or intermittently operated filters are slightly different, and it makes sense to differentiate the studies done on both. This is especially important to clarify because the household level intermittent sand filter potentially has a huge applicability at a household level in developing countries, where water is only put in at certain times of day. Proof of the intrinsic effectiveness of intermittent sand filtration is therefore very important in order to launch household level water filters on a wider scale. The table below, taken from Shaw (1999 [ref.03]Ref.03: Shaw, R. (Ed) (1999). Running Water: more technical briefs on health, water and sanitation. Intermediate Technology, London, UK, p.103. ), shows that as a single process, slow sand filtration was ranked second most effective of all treatment processes after desalination/evaporation, given a range of pathogenic, chemical and aesthetic factors. Ref 01: House, S. J.; Reed, R. A., Emergency Water Sources: Guideleines for selection and treatment. Water, Engineering and Development Centre (WEDC), Loughborough, 1997. Available online. Ref 02: Paramasivam, R.; Joshi, N.S. ; Dhage, S.S. and Tajne, D.S. (1980). 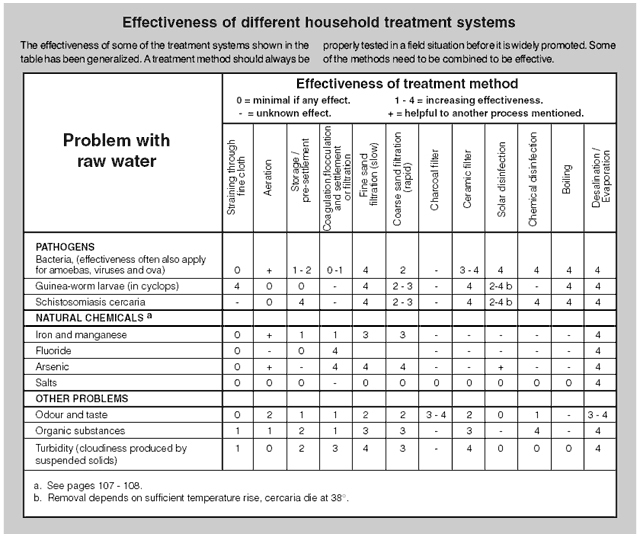 Effect of Intermittent Operation of Slow Sand Filters on Filtered Water Quality. Indian Journal of Environmental Health, Vol.22, No.2, pp.136-150. Ref 03: Shaw, R. (Ed) (1999). Running Water: more technical briefs on health, water and sanitation. Intermediate Technology, London, UK, p.103.